Where to go in Punta Arenas? The square was declared a “Typical Zone” in 1991. 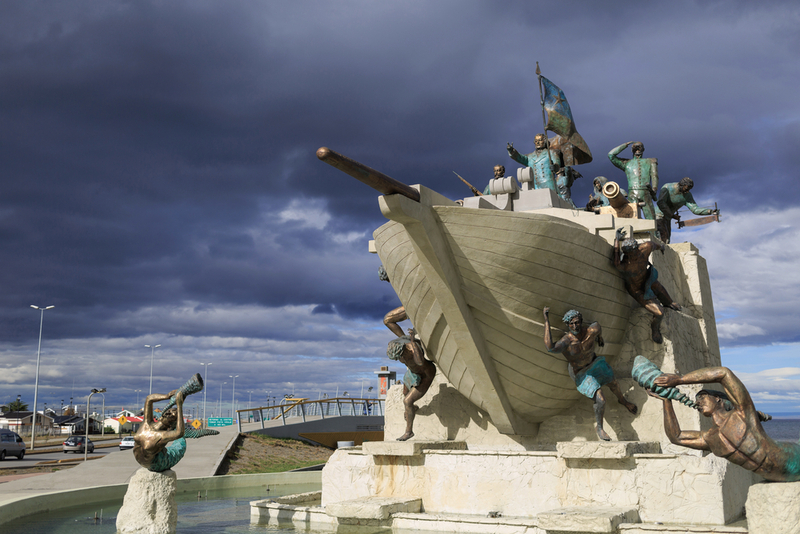 In the center there is a bronze sculpture, inaugurated in 1920, which represents Hernando de Magallanes, the navigator. Constructed between 1894 and 1905, the house has been declared a National Monument. It has been completely restored and you can see the furniture and decorations of the period. It now houses the Club de la Unión. This museum is housed in the Palacio Braun Menéndez, which is a National Monument. The Museo Regional de Magallanes has functioned here since February 1983, with a display of the contemporary history of the Region. The first church, destroyed in 1892, was built completely of wood. Nine years later, a new church was built of brick and dedicated to the Sacred Heart, and this is today the principal church. This museum, the largest and most beautiful in the region, is located at Avenida Bulnes Nº 374, beside the Santuario María Auxiliadora. It has a comprehensive collection of objects from the sector and from the Ona culture. There are also items from Antarctica on display. It was created by the Salesians in 1893 and is maintained with voluntary contributions from the community. In the free zone you can purchase imported articles tax free. It is divided into an area of wholesale warehouses, covering 27 hectares, and a commercial center on two floors. There you will find stores selling electric appliances, electronic equipment and perfumery. Walk down Calle Señoret as far as Colón, where you turn left and go up a gravel street for two blocks. This takes you to the top of the Cerro de la Cruz, from where you have a panoramic view over the city, with its multi-colored roofs, and across to Tierra del Fuego. This is a research center for scientific and technological fields. Information can be obtained about the science, culture and technology of the Patagonians. There is a library and a botanic garden. The naval and maritime museum is located at Pedro Montt Nº 981, together with the Museo Militar. It has an interesting display on the history of the Chilean armed forces in the colonization of the territory of Magallanes and Chilean Antarctica. The municipal theatre is in Calle Magallanes, and stands on the site occupied in 1848 by the first fort at Punta Arenas. The building was donated by José Menéndez.